Pierce The Veil's Vic Fuentes celebrates his birthday today (Feb 10). He also used to write a pretty badass advice column for Rock Sound. Seems like a good time to go though some of his highlights, then! "WILL SMITH TAUGHT ME WHAT CHILLIN' OUT, MAXIN', RELAXIN' ALL COOL WAS TRULY ABOUT"
ANNE-LOUISE ASKS: My friends and I have been arguing about what is the best sitcom ever. Some say Friends, others say The Big Bang Theory. So once and for all, what is the best sitcom in history? VIC: “We will all stand by whatever show we loved growing up, and defend it with our life because it got us through our childhood. "A good sitcom always puts you in your comfort zone when you need to relax. It’s that soothing background noise that can sing you to sleep, or even calm your anxiety when you’ve had too much on your mind that day. 2. "I ALWAYS HAD A LOT OF RESPECT FOR [TWENTY ONE PILOTS], AND KNEW THAT THEY WERE DOING SOMETHING DIFFERENT TO EVERYONE ELSE"
SAMANTHA: I only just started listening to My Chemical Romance after a decade of ignoring them. Now I feel like an idiot - they were awesome! Have you ever ignored a band for no reason and then discovered you love them further down the line? VIC: “I was the same with Twenty One Pilots. I always had a lot of respect for them, and knew that they were doing something different to everyone else, but I just couldn’t get into their music. "Then one day something snapped in my head and I was like, ‘Okay, I get it now!’ Lately I’ve been really digging their new album. Sometimes it takes seeing a band live, seeing their performances, to fully understand what the artist is trying to portray. 3. "I CAN'T REALLY HELP YOU WITH YOUR UNFORTUNATE POO PROBLEMS"
ANDY: My cat refuses to take a crap in his litter tray. Even when I physically put him in it he just walks off and craps all over the floor. Poo is ruining my life. VIC: “I’ve never owned a cat because I’m allergic to them, so I can’t really help you with your unfortunate poo problems, but here’s a story about how a cat once ruined my life so we can at least bond. "I had just started dating this girl, and I was over at her place hanging out. She lived in this tiny apartment with her cat. We started making out, and everything was going great until all of the sudden I started wheezing like an 80-year-old man! I tried to play it off and keep the moment hot, but it ended with me having to leave the house and walk around the block until I could breath again. 4. "IT'S COMMON PRACTICE TO GET YOUR DOG NEUTERED..."
DEBBIE: My dog is totally obsessed with trying to hump the crap out of me. He's two years old now and has been doing this for over a year. I can't even tie my shoes without him going for gold. How can I make him and his 'lipstick' leave me alone? VIC: “It’s common practice to get your dog neutered around eight weeks of age, Debbie. It sounds pretty vicious, but this will make him much more calm. 5. "STAY PROUD AND BE BOLD"
ELLE: My dad mocks me for listening to alternative music and for how I dress. It gets me really down and I don't know how to make him stop. Any ideas? 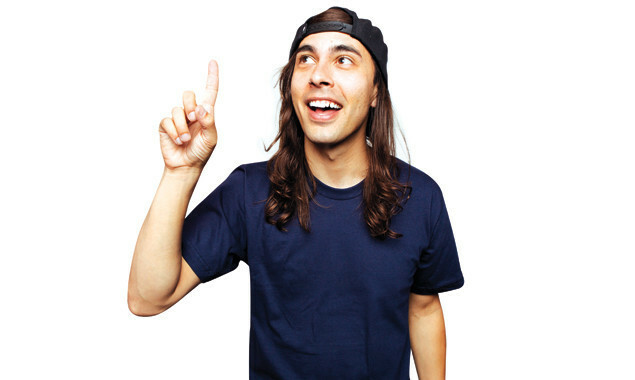 VIC: “If you’re like me, music represents who you are. It’s in the way you dress and the way you express yourself to the rest of the world. "Your parents don’t have to understand your self-image, but they should definitely respect it. When we were younger, Mike dressed like a punk, with spiked hair and chains hanging from his wallet. Our parents didn’t get it, but they never tried to change him. ROSS: I'm currently the singer in a band and I really want to learn to scream so that I can do more with my voice. Do you have any advice on how I could go about learning? VIC: “Screaming is something that everybody does differently. So, you’ll just have to find out what works best for you. Your style and control will come with practice and in time you will begin to develop your own unique screaming voice. 7. "I HATE WHEN BANDS DECIDE AGAINST PLAYING FAN FAVOURITES"
LUCY: Do you ever get sick of playing 'King For A Day'?